A mosaic by Daud Abdullah inside Bridge Artspace. After the Ghost Ship fire in Oakland, Jeff Wright of Bridge Storage and ArtSpace had a big decision to make. The deadly warehouse blaze on Dec. 2, 2016 prompted Richmond officials to take long, hard looks at spaces being used by artists in the city. Since opening in 1997, the 65,000-square-foot Bridge Storage had evolved into a mixed-use space, converting storage units into art studios for some 35 artists. It was not, however, permitted to do so. Just days after the Ghost Ship fire, city inspectors paid a visit to Bridge. "We got red-tagged and had to evict all the artists," Wright said. But instead of reverting Bridge to its original purpose, Wright spent thousands of dollars to bring the spaces up to code. For one of the structures on the property, this meant replacing the roof, removing interior walls, and adding new insulation, energy-efficient heating, fire-rated ceilings and walls, an upgraded electrical system, fire sprinklers, wired-in smoke detectors, double-insulated glass panel doors, and other upgrades. In order to keep rent as low as possible, Wright decided to turn the private art studios into larger shared workspaces, including an office space, an artist space, a maker space, a woodworking/metal shop, and a gallery and lounge. Wright also converted one building into a small film studio, suitable for making videos, commercials, and short films. The membership rate will be $247 per month and include use of the shared spaces (although Wright is still deciding whether that will include the film studio). In addition to the co-working space, there will also be semi-private mobile workspaces of different sizes (pricing for those are yet to be determined). When the space reopens in February, Bridge will be able to accommodate between 50 and 75 artists, according to Wright. The idea of community was very much on Wright's mind during the planning. Referencing sociologist Ray Oldenburg's concept of a place humans need besides work and home, Wright called Bridge "the third place... the place where you go to fill your heart." The community gardens, gallery, and artists' lounge remain, and a donated espresso stand awaits staffing, he said. Not all the artists evicted from Bridge will return, however. But many will. 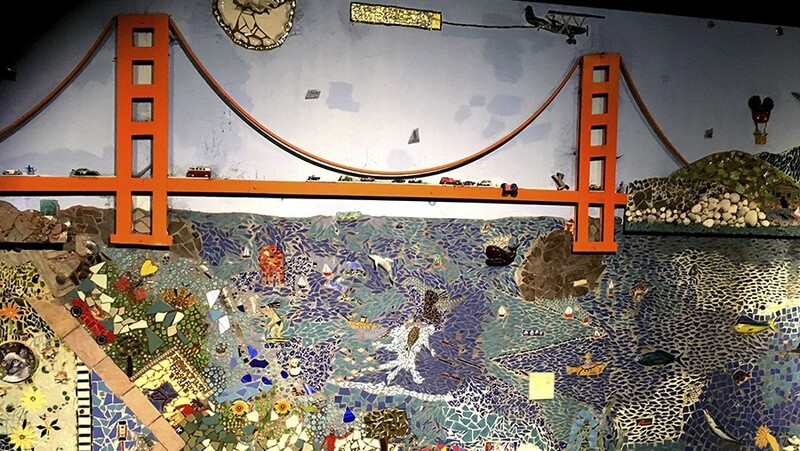 Among them is Bridge employee Steve Hurst, whose art clocks, made from recycled and found objects, are found in both local and international collections. "I grew up in the projects in Chicago," he said, "and I've learned through working here at Bridge how much impact a business can have on a community." Hurst plans to relocate his work studio from his home in Point Richmond to Bridge. Mosaic artist Daud Abdullah is another returning artist. He moved from Oakland to Richmond in 2013. His "treasure boxes" — trash cans covered with folk art mosaics — can be seen all over the city. He discovered Bridge almost immediately after his move, and his work, including a large wall mural, can be seen throughout the community areas. "The space won't be as cheap as it was," Abdullah acknowledged, "but it's gated and safe, and my work uses the community to retell its stories." The new film studio will be seeing a lot of Terry Ver Haar, who describes himself as "an underemployed filmmaker, editor, and cinematographer." Ver Haar and a colleague were looking for storage space for film equipment, "and by serendipity" found Bridge. He said it's an attractive option for video and "independent film types." Another perk is the proximity of artists who can create props, scenery, and costumes in the same complex. Michele Seville, arts & culture manager for the city of Richmond, said that the new Percent for Art ordinance, which sets aside 1 percent of big private development project funds for the creation and inclusion of public artwork in proposed city projects, will result in multiple collaborations between artists and developers in the coming years. An artist is currently being selected to create a large-scale public art project adjacent to the Moody Memorial Underpass on Marina Way South, for which $410,000 has been allocated by the state of California's Department of Finance. Additionally, the "Community Conversations" grant project in the city's Iron Triangle neighborhood will gather "cultural artifacts" from the area and culminate in an exhibit at the Richmond Museum of History and a mural commemorating the neighborhood's history. And last year, Richmond's Arts & Culture Commission awarded 10 neighborhood public art mini-grants to local artists. All projects will be completed by August 2018.